On 08-27-2018, during late evening hours, the San Luis Police received information of a possible threat made against San Luis High School via Facebook. Officers were able to locate the individual, who was arrested and ultimately booked into the Yuma County Juvenile Detention Center under the felony charge of interference with or disruption of an educational institution. The San Luis Police Department, working in conjunction with Yuma Union High School District #70 and San Luis High School, encourages everyone to report any threats to school officials and the police department. The San Luis Police Department wishes to inform the public that such threats under any circumstances will be taken seriously and not be tolerated. Those responsible will be arrested and booked in jail. On October 3, 2017 at approximately 8:10 a.m., officers from the San Luis Police Department responded to a bomb threat that was called into the San Luis High School by an unknown subject. San Luis Police officers in collaboration with local agencies to include Yuma County Sheriff’s Office, Arizona Department of Public Safety, U.S. Border Patrol, and the U.S. Marine Corps Bomb detection unit canines, checked all areas inside the high school for any potential threats besides establishing a perimeter in the high school property. The U.S. Border Patrol also assisted with a helicopter crew that checked the rooftop area of the high school as well as the surrounding areas of the school property for anything that looked suspicious. At approximately 10:30 a.m. the lockdown was lifted after the bomb detection canines concluded their sniffs, which turned out to be a false alarm. At this point, the San Luis Police Department is conducting a criminal investigation in reference to the incident. 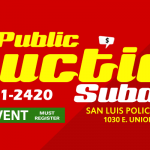 The San Luis Police Department is asking for assistance from the public with any information regarding this incident that could lead to the identification and apprehension of possible suspects. A 15 year old female student from San Luis High School who took a handgun to school on Monday morning was arrested and booked into the Yuma County Juvenile Detention Center later that evening. The arrest came after the investigation revealed that the student had possession of the handgun while on school grounds. This incident caused for San Luis High School to be placed on lockdown that lasted close to 4 hours. Multiple Yuma County Law Enforcement Agencies responded to San Luis High School to assist and ensure the safety of the students and staff. The second student who was reported as having taken a handgun to school was released pending further investigation into this case. The female was booked into the Yuma County Juvenile Detention Center for the following charges: Aggravated assault with a deadly weapon, Minor in possession of a firearm on school grounds, Minor in possession of firearm, Misconduct involving weapons and Endangerment. The San Luis High School was placed on lockdown Monday morning due to reports of a handgun being taken to school by a student. SLPD received a call around 10:00 am with a caller stating that a subject had a possible handgun at school. When officers arrived they were able to locate a potential person of interest and later located a handgun. A short time later the lockdown was lifted and classes resumed back to normal. At about 11:45 am SLPD officers who were still on scene investigating the first gun incident were notified of another possible handgun located on school grounds. SLPD officers located a second handgun and took possession of it. The second student was taken by SLPD officers and was questioned. This second incident was determined to not be related to the first incident. Both cases are currently under investigation. Numerous law enforcement agencies responded to assist on this call. Those agencies included United States Border Patrol, Somerton Police Department, Cocopah Police Department, United States Customs and Border Protection, Yuma County Sheriff’s Office, San Luis Fire Department and the Arizona Western Collage Police. The case is currently under investigation and any witnesses are asked to contact School Resource Officer Zaragoza at 928-341-2420.